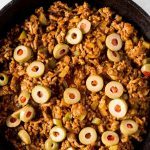 My Picadillo recipe is one of the simplest weeknight meals you can make, it’s very flavorful, uncomplicated to make, and we really love it in our house! 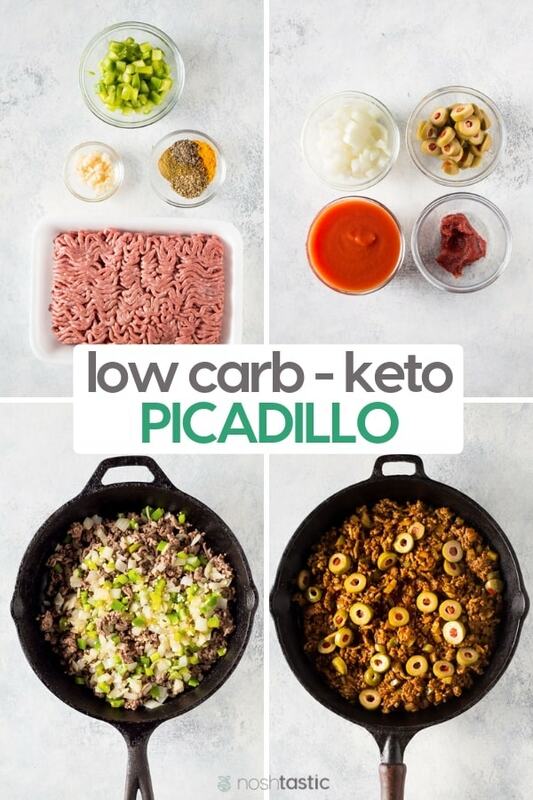 It’s also naturally low carb, we did not use any added sugar like some recipes do so it comes in at around 4g net carbs per serving which makes it perfect for Keto and low carb diets. There are many different varieties of Picadillo out there, including Mexican, Puerto Rican, Cuban, and Filipino recipes. My version tends towards the Cuban Picadillo recipes, but I make no claims towards it’s authenticity! I can tell you it tastes great and I think you’ll love it. 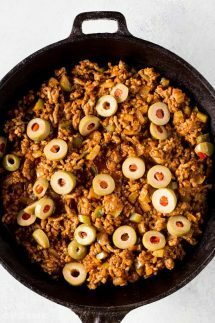 If you like the texture of Sloppy Joe’s it’s similar, but without all the sugar and with some additional flavors including olives, oregano, and cumin. Picadillo is a traditional Latin American ground beef recipe with many regional and country variations. It’s also popular in the Philippines with their version often including either potatoes or chayote. The Cuban version can include ingredients such as pepper, onion, garlic, oregano, cumin, tomato sauce, broth, olives and sometimes raisins, potatoes and capers. The Dominican Republic version sometimes includes hard boiled eggs and all spice. 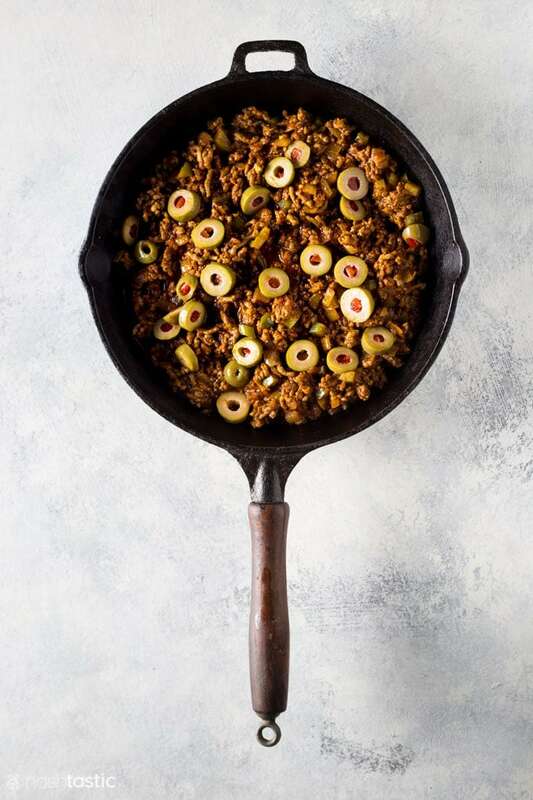 What do you serve with Picadillo? Cuban Picadillo is usually served with black beans and rice. In Puerto Rico their Picadillo is often as a filling for empanadas. We like to serve our picadillo with cheese, sliced avocado or guacamole, or sour cream. 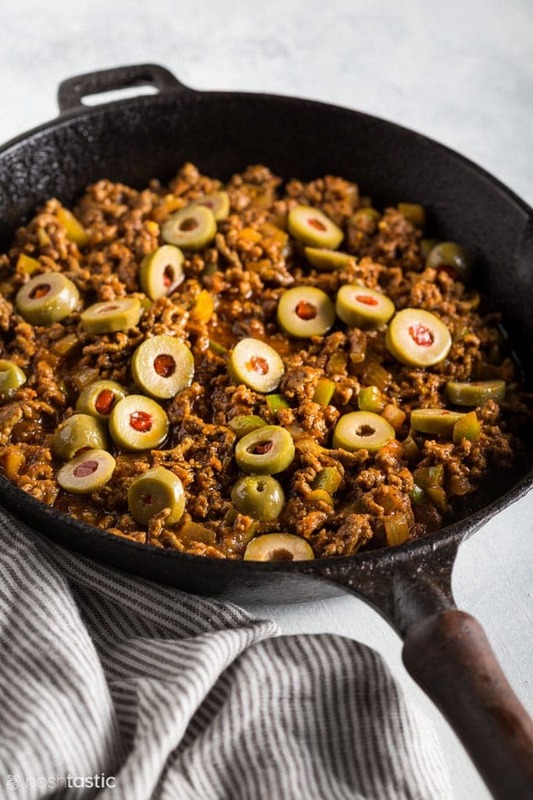 Easy Cuban Picadillo Recipe that's low carb, keto, and gluten free. Season the ground beef evenly with 1 tsp salt and let sit for 10-15 minutes before cooking it. Mix the Picadillo seasoning and set aside. Add 1 tbsp olive oil to a cast iron skillet and add the chopped onions and bell peppers and cook over a medium heat until softened, which will take 8-10 minutes, in the last couple minutes add the garlic. Remove vegetables and set aside. Brown the ground beef in the skillet over a medium heat with a 1 tbsp olive oil, drain off excess fat and water. Return the ground beef to the pan along with the Cuban Picadillo seasonings, tomato sauce, tomato paste, gluten free beef broth, and mix well together. Add the sliced olives and simmer over a low - medium heat for 10 minutes or until the sauce has thickened. Can this be made in a hot pot? If so, how would you do it? We are renovating our kitchen and I don’t have a stove right now …. but this looks so good!! I want it tonight!! great I LOVE YOUR RECIPES AND BLOG! Hi Molly, thank you for your kind comments!! Do you mean an Instant Pot? I think yes, you could make it in an Instant Pot. I’d be inclined to just use the saute setting, or the browning setting (it might be called something different depending on your model) I don’t think it needs to be pressure cooked as the recipe is so quick to cook.